Now, I know you guys don’t know me very well yet, but my husband, Daddy Bear, affectionately calls me hippie/tree hugger/earth mother. I have definite ‘crunchy’ leanings. So obvs I have a veggie garden. And with it reaching the end of summer now, I have a number of very large basil plants which are just begging to be turned into that emerald of pastes, basil pesto. I had never made it before, so I was curious to see just how easy it was to make. I’m not going to lie to you – it was easy, but it was definitely time consuming. And once you’ve picked the basil, you kind of need to get it all done. So make sure that you’ve got a couple of hours to spend on this. (i.e. : don’t start this at 6.30 and expect to have dinner on the table at 7). It’s a beast! This plant gave me 5 jars of pesto – so it made a fair amount. Step 1: Strip the leaves off the stems. The stems are too stringy and aren’t pleasant. Step 1.5: Have a mini heart attack when you realize you have a MASSIVE praying mantis on your hand and it feels like a spider! This is what you get from having an organic, pesticide free garden. Try to convince yourself that this is a good thing and that eventually you’ll get used to the bugs. Step 2: Wash the leaves. Step 3: With a colander in the sink, pour a kettle of boiling water over the leaves, just until they’ve wilted nicely. This makes them nice and tender and makes for a smoother, softer pesto. Step 4: In a blender/decent food processor, blitz the nuts and garlic. (I have used almonds for some and pine nuts – pine nuts are crazy expensive and I have a LOT of basil – so I opted for almonds. Pine nuts are better, but almonds really are still good, I promise.) 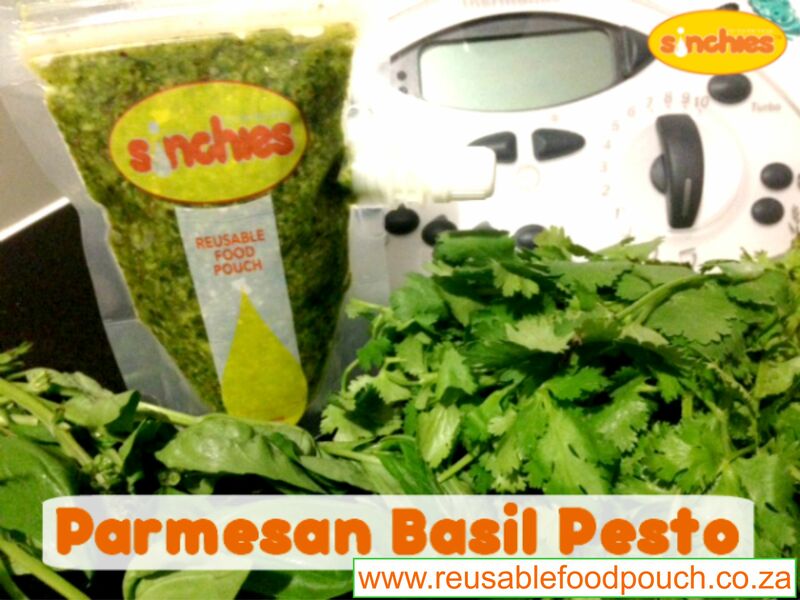 You want to use ¼ cup nuts and 2 garlic cloves to every 2 cups packed raw basil. Add the basil and ½ cup olive oil, some freshly cracked black pepper, and blend/process. Step 5: Grate some Parmesan (I used pecorino) and mix into the pesto. Spoon into your Sinchies and remove as much air as possible before closing. As this is fresh, oxygen will cause the pesto to turn black. It’s not a problem, and it doesn’t affect the taste, but the less oxygen you have, the better. On a side note – this is a really great project to do with your kids. From growing the basil in the beginning, to getting them to help strip the leaves, measure out the oil and nuts, peel the garlic – there’s so much that little hands can actually help with. My particular munchkin decided to take an unscheduled nap so I’m afraid I totally took advantage of the quiet space to knock this out of the park – but had she been awake I absolutely would have used her services! Rinse the basil in a colander. Pour a kettle of boiling water over the basil to wilt it, then run cold water through it or dump it in an ice bath to stop it cooking further. In a food processor or blender pulse the nuts and garlic to chop them a bit – this is more important in a blender than a food processor. Add the basil and ½ cup olive oil and process until the paste is fine and smooth. You may need to scrape down the sides a few times, especially in the beginning. Add grated cheese and black pepper and mix well to combine. Spoon into Sinchies pouches, squeeze all the air out and seal. If you’re going to freeze them, leave out the cheese and add it in when you have defrosted it instead.